Hate speech is usually defined as a verbal attack on someone or some group based on some feature (disability, gender, religion, ethnicity, race etc.). To qualify, it can suffice that anyone finds that speech offensive. Hate speech is thus defined not by what it says, but by whether it is hated by someone. The present article tries to define hate speech in a rational, objective way, thus removing it from arbitrariness and subjective feelings. Denying certain groups their civil rights – like freedom of speech – starts by falsely portraying them as having an agenda aiming at violating other people’s civil rights, as this cartoon does. CODOH is frequently and falsely lumped together with the “Nazis,” who are commonly – and grotesquely – seen as aiming at the mass-murder of everyone who isn’t blond and blue-eyed. Hate Speech is all around us, or so we are told. The Southern Poverty Law Center (SPLC) is one of those organizations that enlighten us about this sad “fact” all the time, and they also list the haters it claims to have found in the US. Among them are the evil Holocaust Deniers, of which that center lists only six individuals or groups, CODOH inevitably among them. There are other groups doing the same, like the ADL and Hillel, for instance. In their attempt to stymie CODOH’s Campus Project, the ADL classified ads submitted by CODOH to student newspapers as “hate submissions.” This categorization had been made popular by Deborah Lipstadt in her 1993 book Denying the Holocaust, which was a major first effort to thwart CODOH’s advertisement campaign. Hence, if we all are to be treated equally, should Elie Wiesel, Edgar Bronfman and the ADL in general, and Daniel Goldhagen as well as other scholars writing in a similar vein all be categorized as hate mongers and hate groups? 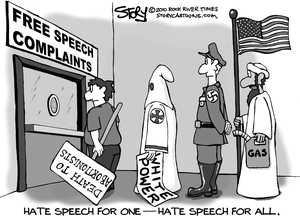 Hate speech can be recognized by the effect is has on others. It makes people hate other people or groups of people. Hate speech can be recognized by the language used. It uses abusive, defamatory, insulting, libelous, denigrating, disparaging words to describe other people or groups of people. Hate speech can be recognized by the actions it suggests. It advocates that the civil rights of others or entire groups be violated, or it at least suggests, justifies or condones such actions. That list is not necessarily complete, and it goes without saying that speech can consist of any combination of these three characteristics. Let’s now take a look at each one of these possible definitions. When Jesus Christ spread his message in Judea, it fomented hatred among some of his fellow Jews, leading to him being crucified and his followers being persecuted. That hateful persecution eventually encompassed the entire Roman Empire. This hatred, of course, was directed against Jesus, his message and against those following and spreading it. Once Jesus’s message had become state doctrine in the 4th Century A.D., however, that persecution in the name of Jesus’s messages turned against all those who refused to welcome and follow Jesus’s message. The resulting hateful persecution of heretics and non-believers by what was later called the Holy Inquisition lasted deep into the modern time. Jesus’s message therefore was capable of triggered hateful feelings, and thus reactions, both in his opponents and in his followers, with millions suffering tremendously over some 18 centuries as a consequence. Does that mean that Jesus’s message is hate speech and therefore has to be banned? The same question could be raised about any religion, and even more so about any political ideology. Here is another example along those lines: When Martin Luther spread his evangelical, protestant message in Germany in the 16th Century, it fomented hatred among his fellow Germans directed against the oppressive Church and state authorities, ultimately resulting in Germany’s Peasant Wars, and eventually in Europe’s first 30-Year-War between 1618 and 1648, which devastated central Europe. To this day, Protestants and Catholics are holding grudges against each other which until not too long ago could erupt very violently in places like Northern Ireland. Therefore, Martin Luther’s message triggered hateful feelings and thus reactions in others, with millions suffering tremendously during the past five centuries. Does that mean that Martin Luther’s message is hate speech and therefore has to be banned? It goes without saying that we do not have to limit this issue to religion and politics. Take the example of Charles Darwin. When he spread his theory of evolution, many Christians felt—and many still feel—deeply offended by it. On the other hand, quite a few people have developed unkind feelings toward Christians rejecting Darwin’s theory. Only in a few cases may these feelings escalate to hatred. However, Darwin’s theory had repercussions which have instilled far more hatred, starting with the eugenics movement, social Darwinism, and the whole gamut of racialist and racist ideologies which are all rooted to some degree in Darwin’s theory of the “survival of the fittest.” Hence, there can be no doubt that lots of hatred was fomented among mankind as a result of Darwin’s theory. Does that mean that Darwin’s theory is hate speech and therefore has to be banned? I have chosen these three examples, because in these cases, answering the questions posed is easy. In all these cases, the answer is a categorical NO. This means that it cannot be determine by the reactions of others whether a speech is hateful. This is so, because the way others react to a speech does not merely depend on its contents, but on many more factors, like the historical, cultural, and societal context as well as the predisposition of each individual learning about the speech. It is a sad fact that people often hear something else than what a message actually says, or they make something else out of it. There is nothing in Jesus’s speeches justifying the persecution of non-believers, just as there is nothing in Luther’s theses calling for violent uprisings, or in Darwin’s theory that justifies the denigration of religion, or racism of any kind. Hatred erupted and keeps erupting because people were and still are putting into Jesus’s, Luther’s or Darwin’s mouth what they did not say, or at times even quite the opposite of what they said and taught. Turning to Holocaust revisionism, it is clear that its message can instill hate in others. Most people develop unkind feelings against the messenger, but there may also be some who develop unkind feelings against individuals or groups who are most visibly spreading the orthodox Holocaust narrative, are profiting from it, or are opposing its revision by at times quite violent means, Jews most prominently among them. Only in a minority of cases, however, will those unkind feelings amount to hatred. The revisionist message as such, however, does not contain anything about attitudes toward anyone. It is merely about reassessing (claimed) historical events in the light of new, overlooked or re-evaluated evidence. Of course, there are writings by revisionists and their supporters that deal with attitudes toward others, but that is a separate issue, or at least it should be. Hence, factual, evidence-based assertions about historical events can never fulfill the criterion of hate speech. Just because others develop unkind feelings when learning about them does not change this fact. If a factual statement about an event triggers emotions in people not directly involved in the event, the reason for that can usually be found in the way they have been conditioned as individuals and members of a society and a culture embedded in a certain zeitgeist. It is true that any event involving perpetrators and victims tends to trigger strong emotions, and so do statements made about such an event. It is therefore wise to choose words of empathy when dealing with such events, but no matter what we say, there is almost always someone who will be offended by what is said. If we all were required to stay silent in order to avoid offending someone – for it could lead to hate – humanity would have to relinquish its ability to speak. According to this logic, the more scientific and scholarly, unemotional and serious, hence factual and well-founded a speech is, the more likely it is to incite to hatred. That’s the way the orthodox Holocaust establishment looks at Holocaust revisionism. If we were to apply this approach correspondingly, Charles Darwin’s research would deserve to be burned on the stake, and Darwin probably alongside with it. That’s the kind of anti-intellectual and anti-scientific attitude which endangers modern society at large, as Carl Sagan has correctly observed. Cussing at people or groups of people or calling them names is a good indicator for hate speech, although it may depend on the context. If an African American within his circles calls his fellow African Americans “niggers,” that is not seen as an insult, because that expression is commonly used among many African Americans, but if a member of any other group uses that word, it is seen as an expression of denigration and thus hate. Whether that is always so again might depend on the context. The situation gets more complex when dealing with expressions that are not denigrating as such but which contain specific accusations that can be true or false. For instance, calling someone a criminal, a fraud or a liar may or may not be an insult, depending on whether or not the accusation can be demonstrated to be true. It’s different when making sweeping accusations against entire groups, however, such as “all Jews are liars.” Except in a trivial way – in terms of all humans are liars, as everyone has lied at least once at some point in their lives – there is no way of ever proving such a statement to be true, hence it is defamatory and thus has the ability to instill feelings of hate. There are borderline cases, like the claim that Jews control U.S. foreign politics, or that the U.S. government is a ZOG – Zionist Occupied Government. Such a statement can in theory be shown to be correct or at least permissible, if the claim, sweeping and exaggerated as it may be, is pointing in a direction that is closer to the truth than any other similar assessment. We have seen it in the libel trial of David Irving against Deborah Lipstadt. Although the court found that some of Lipstadt’s statement about Irving were defamatory, it found that Lipstadt’s book is not defamatory as a whole, for the things it correctly stated were close enough to the truth to make the few mistakes it contains irrelevant. Holocaust revisionist texts deal with history. They do not use libelous terms in any regard, and they also usually don’t concern themselves with making sweeping accusations against any particular group. Where they make them, they are usually qualified in terms of proffering evidence to support the claim. More frequent are accusations directed against witnesses – victims, bystanders, perpetrators – of erring, exaggerating and lying, in each case usually backed up with evidence to support the claim. The orthodox Holocaust narrative is largely based on anecdotal evidence. If that narrative claims to be backed up by scholarly research, it needs to allow, even welcome the critical evaluation of oral claims made. Errors, exaggerations and lies by witnesses are the daily bread of every oral historian, and one of the duties of a scholar active in that field is to separate the wheat from the chaff. Although using potentially offending words to describe the lack of accuracy and reliability of a witness should be avoided as much as possible in order to maintain a detached, objective, scholarly attitude, there are sometimes clear-cut cases of lying where it must be allowed to call a spade a spade without running afoul of the thought police. Because let’s face it: people do lie all the time. As a matter of fact, learning how to lie and how to deal with lies and liars is a very important skill children must learn in order to succeed in human societies. Research has shown that we lie all the time, in particular to ourselves. So, as a Holocaust revisionist, I may rightly ask: why should Jews be the only exception to the rule, in particular when it comes to a topic where so much is at stake for them? At the end of it, the proof lies in the pudding. And again, just because some individual turns out to be indeed a liar, that does not mean that people are then entitled to develop feelings of hatred toward that person. Saying “you are a liar” does not contain the message “and thus you need to be hated,” in particular when considering that lying and exaggerating about our past experiences is more common than most people think. If a person jumps to that conclusion anyway, it is his or her own responsibility. I remember that, as a young man, I was very impressed by the way some German political think tank was statistically evaluating the speeches of various German members of parliament for their “radicality.” They looked for words that were considered negative, such as insulting, spiteful or even hateful terms, gave each of them a value depending on how extreme those terms were considered, and made a tally. Their research showed that, the more a person’s political views were considered “off-center,” the more radical was his or her choice of words. That definition is untenable. Take religion. If it is legitimate to criticize a religion, then why is it not equally legitimate to criticize, even verbally attack a person adhering to that religion? Today I have severe reservations about that approach, because perforce it tends to portray those in power as moderate, while those in the opposition are portrayed as more or less radical, depending on how much they are in opposition to what those in power are doing or proposing to do. By the very nature of democracy and parliamentarianism, however, it is an opposition’s obligation to criticize a government and to hold them responsible for what they do or plan. Those in power can always be more relaxed, while those in the opposition have the liberty of being more profound, even radical with their critique. If we turn to actual abuse of power by governments, it is clear that an opposition revealing such abuse will at times use strong words to describe that abuse, while a government has the tendency to veil or justify that abuse in calm, even legal terms that sounds very reasonable. In extreme cases, where a government actually persecutes an opposition, the powerless victims of that persecution might scream bloody murder, while the government simply describes them as common criminals subject to perfectly normal and justifiable legal proceedings. If we were to analyze the speeches of either side in such a struggle using the above approach, it would turn out that the opposition is extremely radical, while the government is moderate, when in fact the exact opposite might be true. Hence, by their very design, such analyses of political speech tend to justify and thus stabilize governments, while they undermine the credibility of oppositional groups. What I am getting at here is that speech needs to be seen in its context. To give one example: During the struggle against South-African apartheid, the ANC used radical terms in their fight against government policies, while the South-African government used cool legal terms to describe their suppression of this oppositional group. We can apply that to any such constellation. Hence, political speeches cannot be fairly evaluated without their proper political and societal context. If an oppositional group has justified grievances, it is also justified to use fitting terms to express them. The more extreme the grievances, the more they justify extreme expressions. But where does it stop? To stick with my example, during the era of South-African apartheid, some members of the ANC at times advocated or justified the use of violence against representatives of the government, of other ethnic groups, or of competing oppositional groups. Although it is true that the political persecution which ANC members suffered made it acceptable for them to use strong words when talking about it, advocating, suggesting or condoning the violation of the civil rights of others is the very line we need to draw. Passing it is unacceptable. Under certain circumstances, all governments of this world curtail the civil rights of their subordinates – when punishing offenders of the law for crimes committed. Such legal prosecution can turn into illegitimate persecution, however, if and when the law itself is in violation of inalienable human rights. Then, the justified curtailing of civil rights turns into their violation. “Hate speech” legislation is a case in point. If such legislation outlaws speech not because it calls for the violation of other people’s civil or human rights, but simply because some section of the population might develop unkind feelings toward another when listening to a speech, then “hate speech” is not defined by its content, but by the effect it might have on others. If the political or social conditions are tuned accordingly, such laws would get Jesus Christ, Nicolaus Copernicus, Giordano Bruno, Galileo Galilei, Martin Luther, Thomas Jefferson, Benjamin Franklin, Charles Darwin, Mahatma Gandhi, Martin Luther King Jr. and all the other heroes of our civilization into peril. In fact, when looking at these individuals’ fate, we see that most of them did suffer to one degree or another because of that governmental attitude. Hence, hate speech may never be defined by someone else developing feelings of hatred, but by the speech itself calling for or justifying violations of civil rights. Think about the discussion in the U.S., in the context of the “war on terrorism,” whether it should be justified to subject suspects to torture. Individuals who justified third-degree interrogation methods argued very coolly and rationally. There was no hateful terminology in their language, no radical terms in what they expressed. And yet, they advocated and justified the violation of the human rights of others. It was and is hate speech in its purest form, but it was broadcast and taken seriously by the entire established media, who don’t seem to have any rational, systematic tools to detect hate speech. They just go by their guts, by what they “feel” about a speech. If they hate it, it must be hate. This discussion about torture wasn’t taking place in a vacuum, by the way, but at a time when people were – and still are – subjected to conditions in Guantanamo and elsewhere that can only be described as gross violations of their human rights. Hate speech therefore does not have to use hateful terms. In fact, advocating or justifying that someone’s civil rights should be violated is most effective if it comes with emotional detachment and scholarly reasoning. It’s still hate speech, though. On the other hand, expressions of hatred are not necessarily hate speech. I hate brown recluse spiders, because I got bitten by one last month, but that expression doesn’t make it hate speech. Hate is an emotion that can, at times, be justified. It all depends on the circumstances, and it all depends what me make of it. Just as love doesn’t allow us to harm people, hate also doesn’t give us permission to wantonly harm or destroy the objects of our disdain, or to advocate or justify such acts. There is another form of “hate speech” that is rarely talked about: condoning hateful actions. In the “war on terror,” most mainstream media have been and keep looking the other way when it comes to governmental violations of civil rights, whether they take place in the United States, in Guantanamo Bay, in Iraq or elsewhere. Wars tend to have that effect on mainstream media. They turn into lackeys of the government. It wasn’t any different during and after the Second World War either, when the victorious Allied nations committed their own crimes against humanity by implementing a policy of vengeance against the German people. Many a media outlet of those nations decided to look the other way. The New York Times, for instance, decided to report nothing about the anti-German mass slaughter and ethnic cleansing going on in Europe after the war. After all, the Germans had it coming, so deal with it. Hence, there is hate speech – speech that advocates or justifies the violation of the human rights of others – and there is hateful silence, a tacit condoning of hateful acts that amounts to aiding and abetting in crimes, in particular if it is committed by people whose job it is to report about such things: the journalists of mainstream media. This phenomenon is more widespread than we think. Censorship by omission is a common practice of all media. There are always some topics they won’t cover, or will cover only in a slanted, negative way, and there are some individuals or groups of people about which the mainstream media simply won’t say anything positive or supportive, lest it might help these pariahs in any way. The reason for this is that these groups at the fringe of society usually have an agenda, be it political or otherwise, that is despised – or even hated – by the mainstream media. Hence, if the members of such an ostracized group are unjustly persecuted, the media simply won’t speak out. Worse still, they might actually pour oil into the fire of persecution, asking for it to be intensified, so that those who had it coming all along finally get what they deserve. Both hate speech and hateful silence are most dangerous when they are committed by those with power and influence: by the government, and by the mainstream media. Both usually come under the cloak of respectability, integrity, and moderated, reasoned arguing. Hence, both cases are rarely ever even noticed. 5. Where Is CODOH in All This? CODOH has the policy of not accepting, publishing, supporting or promoting any material that advocates, justifies or condones the violation of the civil rights of others. Revising the history of the orthodox Holocaust narrative is just as perfectly acceptable as the revision of any other chapter of history. We draw the line, however, if anyone tries to justify or condone the civil rights violations committed by the Third Reich. We can discuss whether there were homicidal gas chamber used by the Third Reich to mass murder people, or whether the Third Reich planned and implemented a policy of extermination against Jews, Poles, Russians, Gypsies, Jehovah’s Witnesses, Homosexuals, etc., until we’re blue in the face, but we will not accept, publish, support or promote anything that tries to justify the use of homicidal gas chambers, or any other form of murder, or the implementation of any kind of policy in violation of civil right, be it a policy of ethnic cleansing, deportation, slave labor, or extermination. If it happened, it is unjustifiable. If it didn’t, the record needs to be corrected. The only way to distinguish the one from the other is by having an open debate without threats or name-calling against anyone. Our commitment does not stop with the past, however. We will also not accept, publish, support or promote anything that advocates or justifies the violation of anyone’s civil rights today or in the future. Hence, nothing we publish about the past justifies accusations of civil-rights violations today or in the future. This follows the millennia-old golden rule that we must not wish onto others what we don’t want to happen to ourselves. Plain and simple. Hence, all those accusing CODOH of being a “hate group” spreading “hate speech” not only have it all wrong, but the shoe may actually be on the other foot. If they advocate, justify or condone that we at CODOH, our members and supporters be deprived of some of our civil rights just because they don’t like our peaceful discussions of historical events, then their speech is a perfect match for real hate speech. Carl Sagan, “The Fine Art of Baloney Detection,” Parade Magazine, February 1, 1987, pp. 12f., here p. 13; www.csicop.org/uploads/files/ParadeFeb11987.pdf. www.splcenter.org/fighting-hate/extremist-files/ideology/holocaust-denial: The Barnes Review, Campaign for Radical Truth in History (Michael Hoffman), Carolyn Yeager, CODOH, Deir Yassin Remembered, IHR (Mark Weber), Irving Books (David Irving), The Realist Report (John R. Friend of The American Free Press/The Barnes Review). ADL on the Frontline. Anti-Defamation League, special summer edition 2003. John Sack, “Inside the Bunker,” Esquire, February 2001, pp. 98-140; here p. 140; http://germarrudolf.com/wp-content/uploads/2012/04/ListPos62.pdf. Elie Wiesel, Legends of Our Time, Schocken Books, New York, 1982, Chapter 12: “Appointment with Hate,” starting on p. 142. Speech delivered on April 7th, of 2017, at the University of Oxford, England; youtu.be/wgPLG_1BvQo. Patrick Bahners, “Objektive Selbstzerstörung,” Frankfurter Allgemeine Zeitung, Aug. 15, 1994, p. 21. Charles Gray, Judgment, Queen’s Bench Division, Royal Courts of Justice, Strand, London, David John Cawdell Irving v. (1) Penguin Books Limited, (2) Deborah E. Lipstadt, ref. 1996 I. No. 1113, §13.167; https://hdot.org/judge/#judge_13-11-2 (Sept 1, 2016). Dan Ariely, The Honest Truth About Dishonesty: How We Lie to Everyone – Especially Ourselves, Harper Perennial, New York 2013; Bella DePaulo, Behind the Door of Deceit: Understanding the Biggest Liars in Our Lives, CreateSpace, Scotts Valley, Cal., 2009; idem, The Lies We Tell and the Clues We Miss: Professional Papers, CreateSpace, Scotts Valley, Cal., 2009; idem, The Hows and Whys of Lies, CreateSpace, Scotts Valley, Cal., 2010.